Love this small lightweight headlamp even on the lowest setting it's plenty bright to see down the trail. Convenient USB charger cord and a fast recovery charge, nice too ! To arrive at the more safe bike paths, I always have to ride on the streets. I always ride in the day time, never in the dark. With the Urban on pulse mode, I've noticed that vehicle drivers more readily notice me, and are much more respectful in allowing me space or the right of way. I believe the really dangerous drivers such as those that are distracted by talking on the cell phone, and the very senior people with vision issues are much more likely to actually see me when I have the Urban light on. Although I never take any driver for granted, I do feel more safe with the light. Beautiful design, great power options, easy to use and charge! 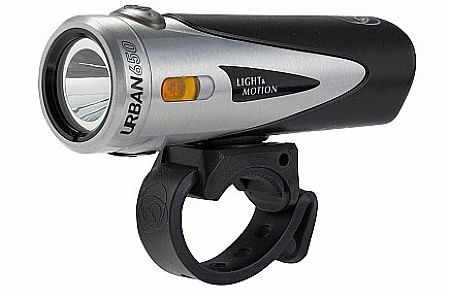 The light and motion urban 650 light is great for being seen on the bike, and being able to see during dusk, shade or dark. It helps be more visible and improve safety on the road. Light is good, the onchange switch is difficult. Too much pressure and too much time to adjust the light while riding. When trail riding, I like to lower my light intensity as a curtesy towards an on-coming rider. The switch is not responsive enough. In my opinion it requiring too much pressure and too much time for onoff function to work safely. GREAT LIGHT, . I can see the way. I enjoy the light, nothing I dislike about its performance. This light is compact and light weight but very bright and the charge holds a long time. Got them on sale from Western and when it came up again I ordered another for a total of 3. You can't beat this light for versatility. In the woods I run 2 of them and it is like daylight. Got this to give to my daughter as a gift. It was on sale at a great price. It had the same output as mine which is another brand. It had better output than mine. Was impressed with it. Great value for a really great light! This is everything I could have asked for. I do not do a ton of night rides, but when I do this light does a great job illuminating the whole road. I would definitely recommend this light and this brand. Weve got a family full of Light & Motion lights. Theyre long lasting per charge, 3 brightnesses plus a pulse mode, waterproof and affordable. I had a rattle develop in one and customer service replaced it express. Used for daily commute in order to see. I use 2 lights. I have a different more obvious flashing light that is my be seenlight. Reasonable battery life - no problem for a 20 mile ride on high setting. Gives ample warning when battery is getting low but still has a good deal of charge remaining. Great package and the light output illuminates the road or trails for night riding. Wish it had a bit longer battery life then 60 mins at full brightness but will just have to pedal faster for now.. I ride at 0400 under canopy and in bearcougardeer country. When you cant see whats ahead its pretty dang scary. The guys I ride with have similar lights and always found myself coveting those. I broke down and purchased one. Man! WHAT a DIFFERENCE!!!! When we ride side by side weve actually had on coming drivers flash their high beams at us thinking we were a car. I would recommend this even for the price, does safety have a price? Use for commuting Easy to charge, plenty of light, but had a failure. One morning I left for work and when I arrived the light was gone. I didn't notice that it had come off somewhere along the way. The mount was still on the handlebar, but the light was gone. There is a locking thumbscrew that will keep the light from popping out of the quick release mount, but nowhere in the instructions is this explained. There is something about it on the Light & Motion website, but it's really buried and hard to find. I like this product. It is light, compact and powerful. I woud give 5 stars except that the screw that secures the unit in its attachment is tedious to srew out and back in. Ive used L and M 600 plus lumen night lights for years with excellent experience. I have a 300 that I liked so well that I bought a 700. The 700 died but the 300 is still going strong. The new 650 is as bright as the 700 but doesnt last nearly as long as the 300 when both are on the brightest setting. And the new 650 has a much shorter strap that makes it a pain to put on and take off. I used to get comments from oncomers about how bright the 700 was, I havent had the same reaction with the 650. Great light at a great price. Bright on the trail. But, i have the light on my helmet and have to unscrew the pin from the strap to remove the light to charge after each ride. Also, the cover for the usb port has already popped out of the light fixture which is a critical component to keep the dirt out of port. I commute 25 miles to work before the sun comes up, lights up the road well and makes for a safe commute, does not take up a lot of room on the handle bar and is not very heavy.